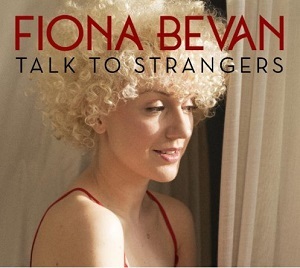 "Talk to strangers" is the debut album from singer-songwriter Fiona Bevan. Fiona Bevan is probably a new name to most people but she has written songs for other artists and co-written at least one song millions of people have heard - along with Ed Sheeran she co-wrote the song "Little Things" for the band One Direction. Happily though this album bears no resemblance to One Direction. She describes the as "Pop in disguise", and that's certainly a good description as while there's a lot here that you could call pop there's also a lot you probably wouldnt associate with pop. There are parts that have quite a pop feel to them and others that are more Folk, and others that aren't really either but one thing about all the songs is that they all sound great. As well as the usual instruments there are also appearances from Violin, Double Bass, accordion, Harp, a Hapi drum, real birdsong, and some bird song whistled by Fiona. The album opens with the excellent "Rebel without a cause" - watch the video below and hear for yourself how good it is. "Slo mo Tiger Glo" is one of the more "pop" tracks on the album, and is another great song - in fact the whole album is great. There are so many albums these days that are good but nothing special and are bland and forgettable, so it's great to come across an album like this that stands out from the crowd, has catchy songs yet has depth to it, and which is a pleasure to listen to all the way through.